Since I’ve spent the last feels-like-a-very-long while not blogging, I have some catching up to do. Although not all that much, because I wasn’t knitting hardly at all for most of that time. I made these quite awhile ago now, but I’m still smitten. • Started and finished in December. 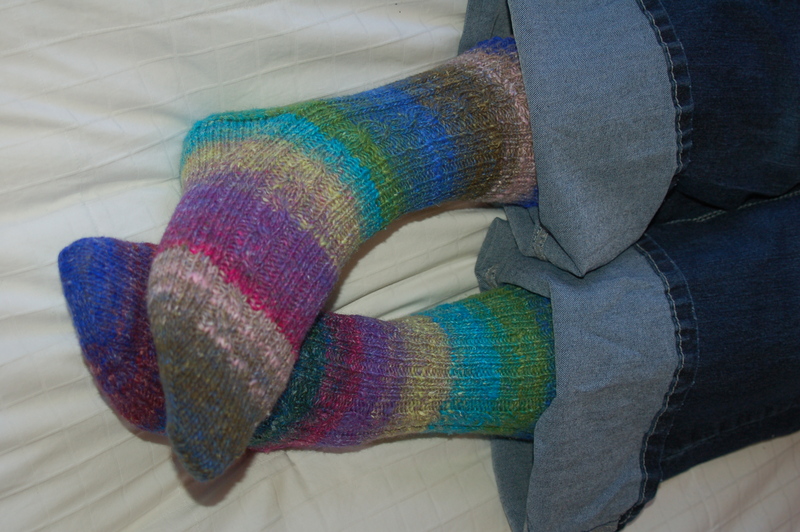 • Pattern: So Simple Silk Garden by Glenna C.
• Yarn: Noro Silk Garden Sock — apparently I didn’t jot down the colorway number. • I worked the cables without a cable needle! • I love Noro yarns. The long color changes, the single, everything. It reminds me of handspun, at least in some ways. And these were made even longer ago, but I think I might love them more. • Started and finished in November. 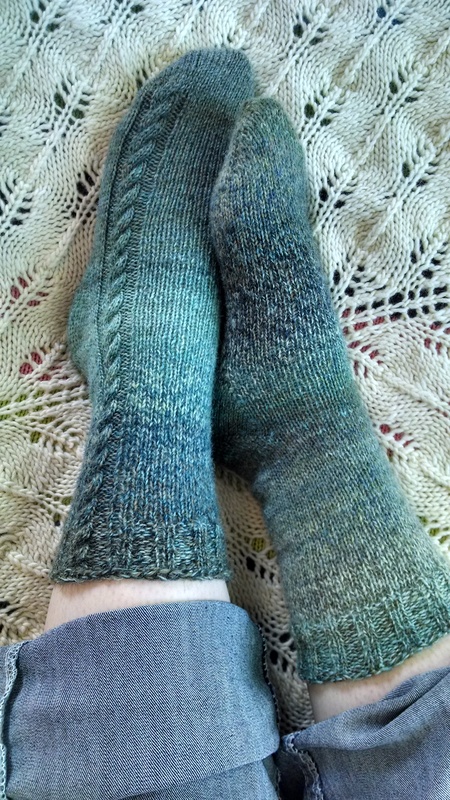 • I loved how not-just-a-plain-stockinette-sock this was, while still being very simple and straightforward. I will (and have) sought out more patterns like it. Do you wear colorful socks? I started these socks as we were on a 7-hour (one-way) road trip. I knew I’d have the chance to get a bunch of knitting in, and I wanted something small and mindless but not too quick to finish. 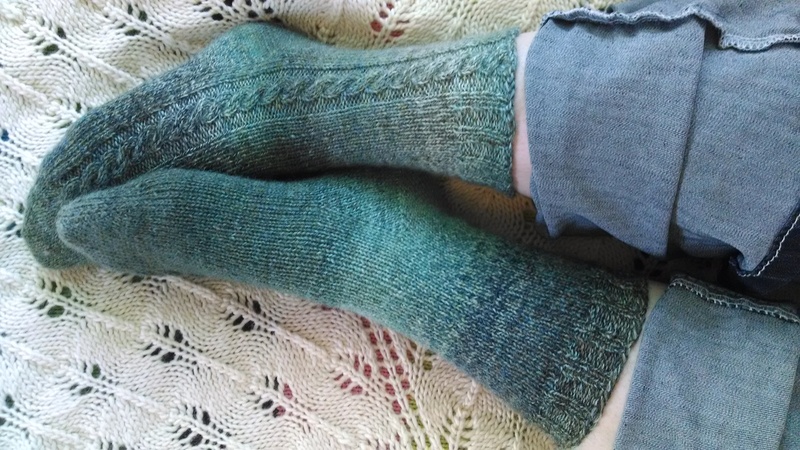 Simple socks it is (Rav project page)! 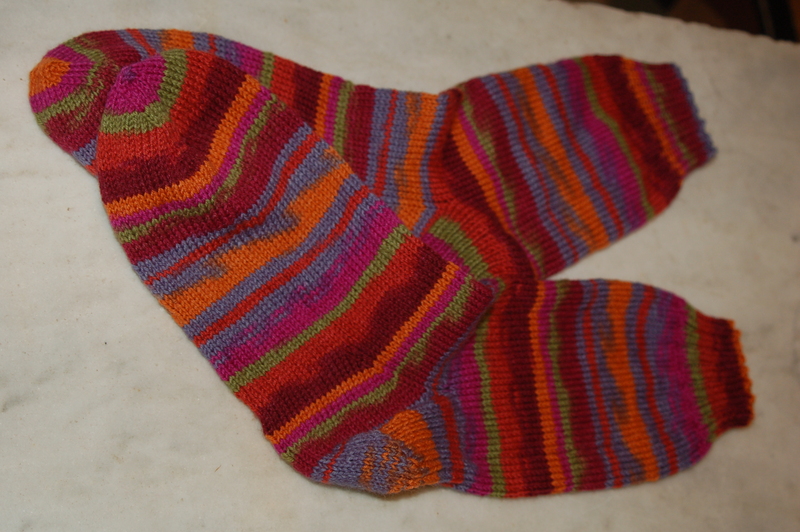 On that one trip (there and back), I nearly finished the first sock. 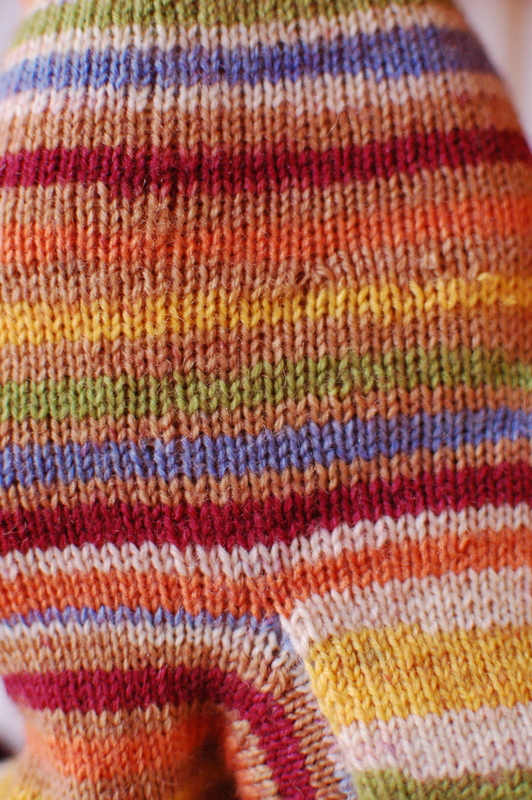 The skein (Patons Kroy Socks Stripes) for the second sock had a knot and a color change that completely messed up the progression (you can see it at the top of the sock on the right of the photo), which bugged me but I just went with it. During that first day in the car, I put them down when it got too dark to see. But then, maybe 40 minutes later, Paul asked why I’d stopped knitting. He figured since knitting was such a tactile activity, I would be able to knit without benefit of eyesight. Well, I’d heard of people who capably knit simple things in dark movie theaters, so I decided to try it. The results were less than pretty. So, I learned that I need to practice being less dependent on my eyes while I’m knitting, while I still have access to light (say, when I’m watching football). I’m not quite there yet, to the point where I can knit beautifully in the dark. Although circular needles would help a lot, instead of using double-pointed needles. I seemed to have trouble at the start of each needle. I’m so behind on posting yarny reports that I don’t know where to start. 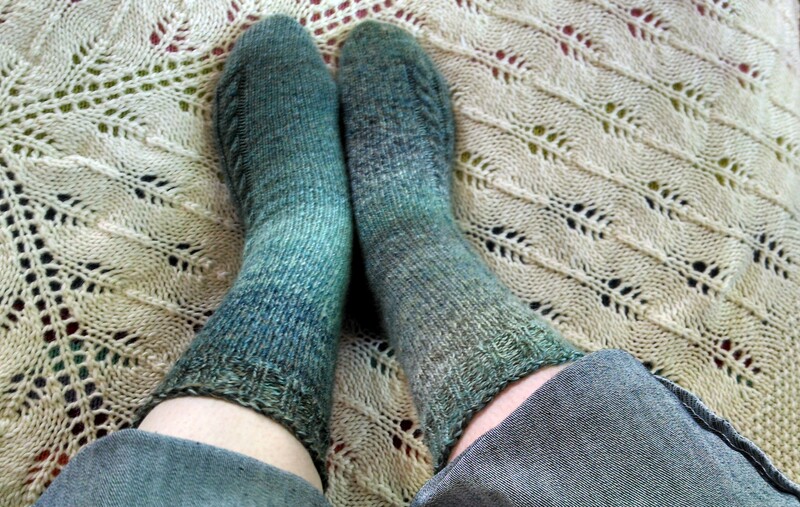 Yarn: Plymouth Yarn Sockin’ Sox; it was a huge headache, until I settled on this pattern. It was pooling horribly no matter what I did, otherwise. 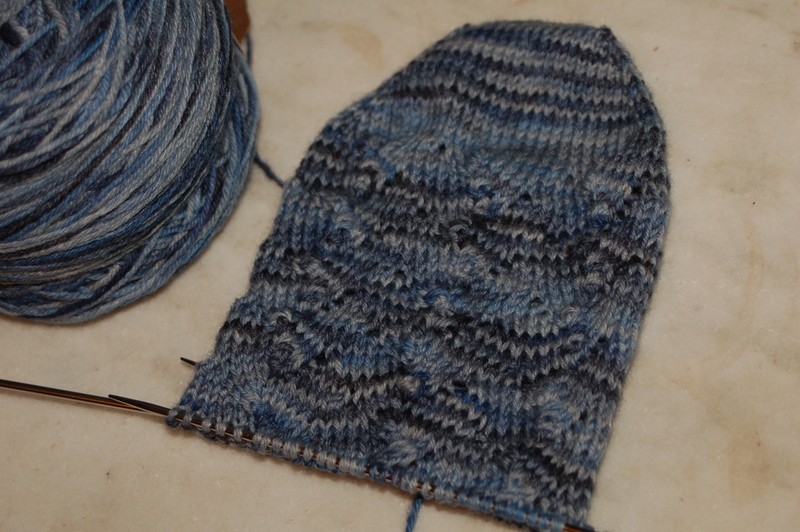 I was glad for a pattern that combated the pooling, but the pattern got repetitive and boring very quickly. I had to force myself to make the second sock. Alas, most of my knitting since the Monkey socks must remain secret for awhile. I think I’ll leave it at that for today. 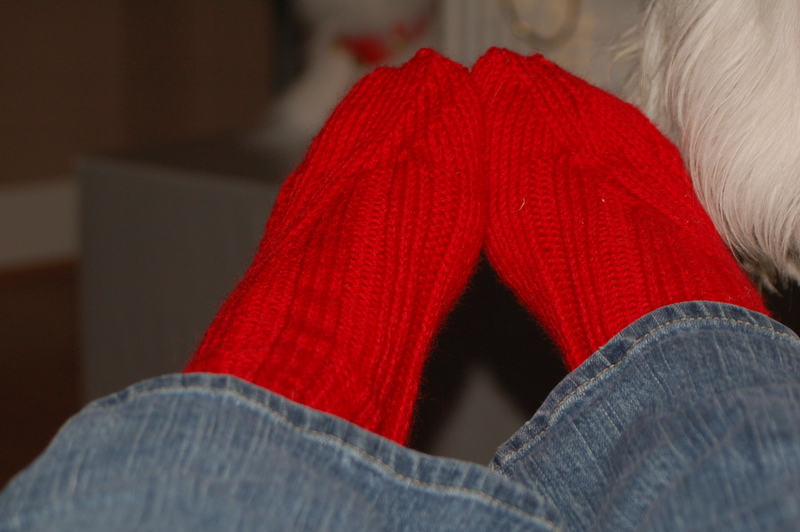 Handknit socks make me happy! 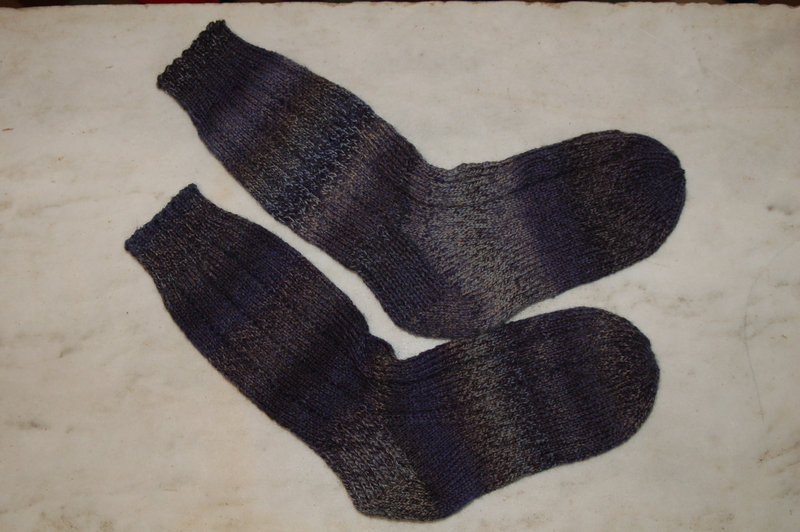 I’ve recently finished two pairs of socks, and I’m getting ready to start another two. 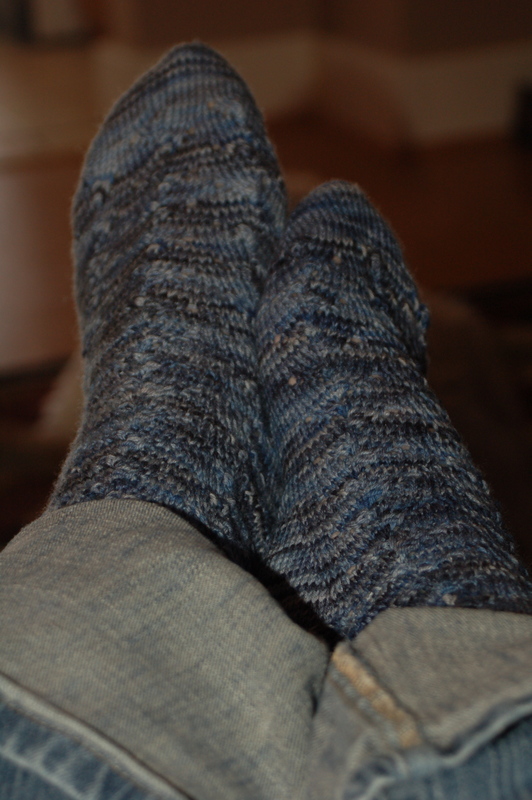 This is my first pair of worsted weight socks, and they went really quickly. The pattern‘s a translation, though, and not very easy to follow. It also assumes a certain amount of sock-knitting knowledge. I thought I took excellent notes as I went along, but the toes ended up different than each other anyway. I dithered for more than a week, trying to decide if I could live with the inconsistency, but I finally just decided to finish them. I used stash Lion Brand wool, it took less than 2 skeins for the pair. 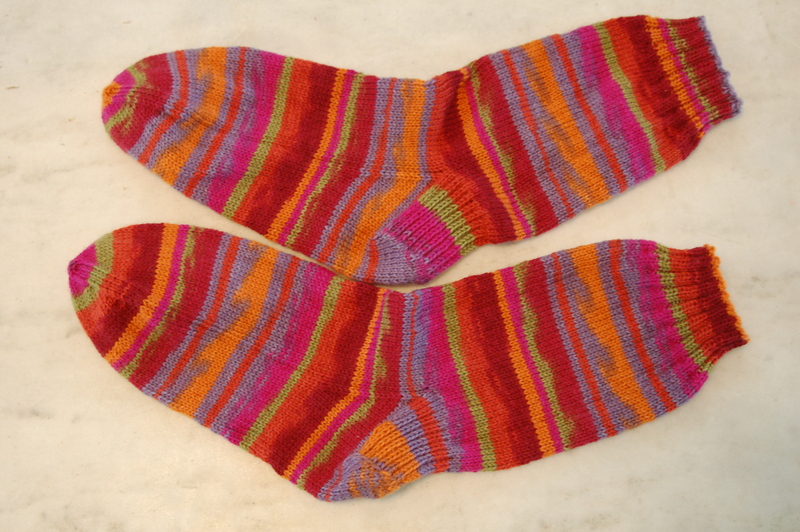 These socks were my first toe-up socks, and the making was not without hiccups. I had to rip them out several times before I finally got the needle size and foot length right. All that’s really my fault, though, not the pattern’s. I really love them! 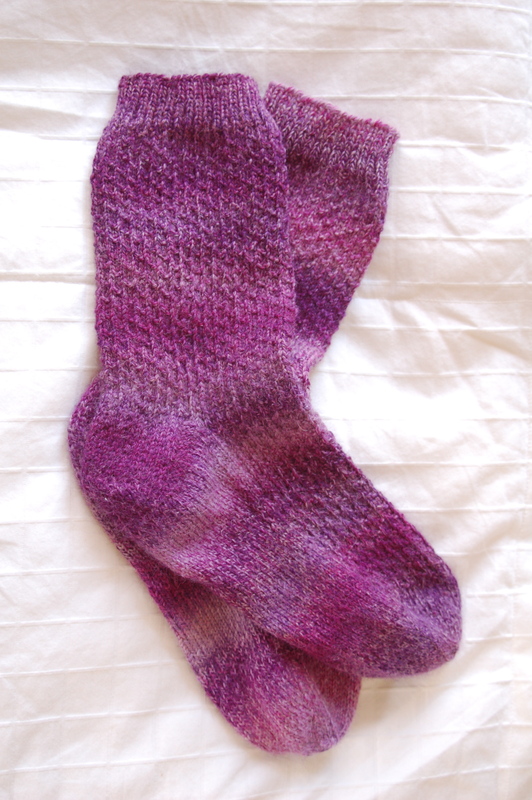 I’ll definitely be making more toe-up socks. Just realized my bind off at the cuff is too tight. 😦 But they’re still very wearable. I do hope this yarn holds up better than the other from this brand I used, though (which had different fiber content, so I think there’s a decent chance — plus, these are knit at a smaller gauge, which has to help, right?). This hugely popular pattern is sung as the (one of the) preeminent answer(s) to pool-happy yarn. 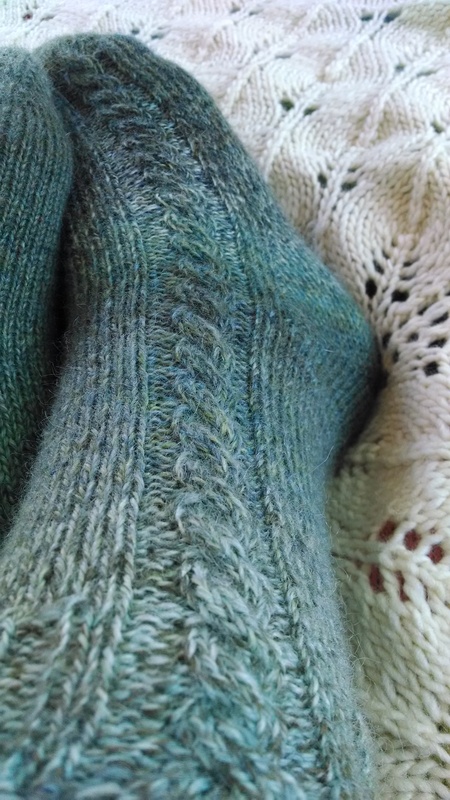 Which is what I discovered I have after casting on for a pair of stockinette short socks a month or two ago. (Well, at least at the gauge I was working at.) So, Cookie A. Monkeys it is. Remember this yarn? Yeah. I’m planning to use this Wendy Knits pattern. This definitely calls for a simple pattern, as I’m expecting the yarn to sing. After looking through patterns, I’m hopeful I’ll have enough of this yarn to not require something else for the cuffs or heels/toes. 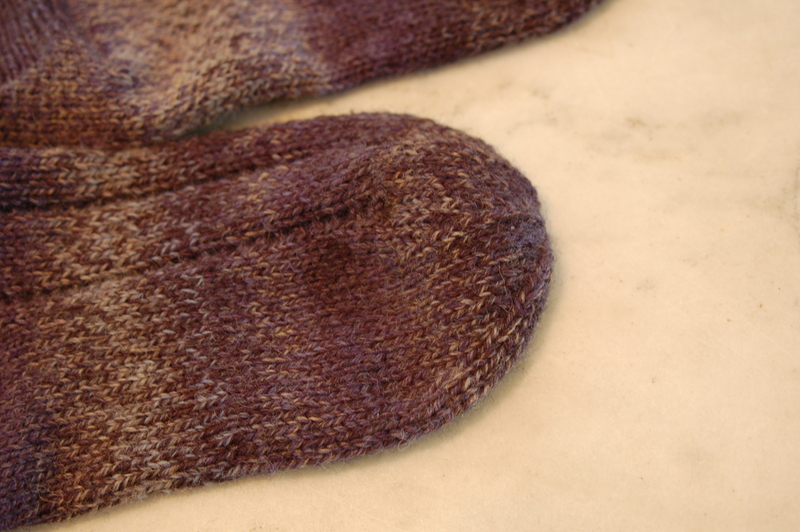 Last week I mentioned the Rivulets sock (Rav link). 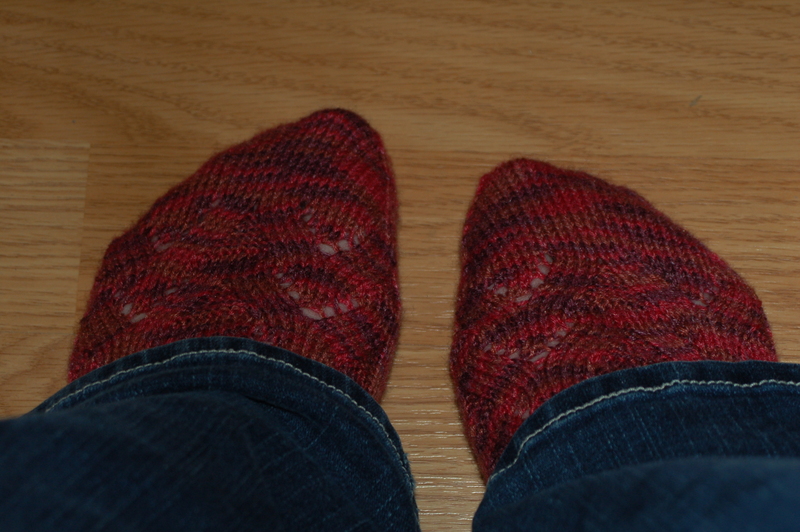 Early this week, I got past the heel (for the second time), and once again I have to rip back. The sock’s foot is too long! Yarn: Araucania Ranco Multy, in colorway 328. For more information, see my Ravelry project page. I really love the yarn’s colors, and while I’m not convinced the variegation is the best match for this pattern, I don’t have enough of a solid-color sock yarn stashed that I want to use for it. And I think I’m committed to finishing this sock at this point. I’m grateful, though, that I’ll only have to rip out the heel this time and won’t have to start completely over. I discovered that the Rivulets was too long right before leaving for knit night, and I was flailing around for a project to take. I finally just grabbed a skein of sock yarn and hoped to find a good toe-up pattern (since I’m determined to make sense of toe-up construction!) at the shop. 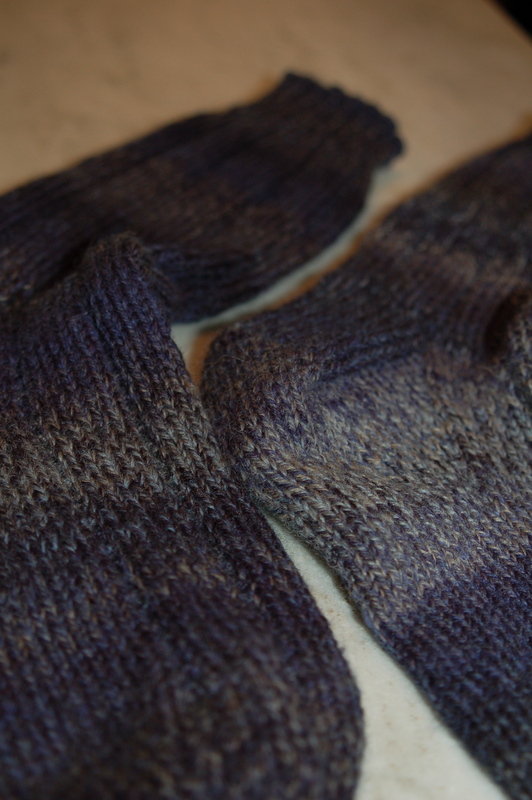 Well, I didn’t find a sock pattern that interested me, so I just cast on for a basic short sock to keep my hands busy. I got a little worried about the yarn pooling on the heel flap, but I figured that it was just the heel flap and all would be resolved once I was back to working in the round. But. 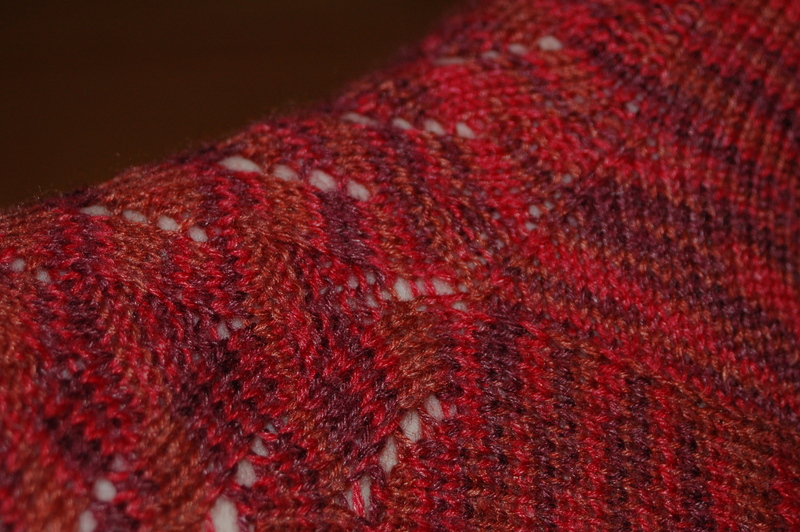 The unsightly pooling continued through the gusset, and only worsened once I returned to even knitting. Alas! I desperately want your sock patterns! 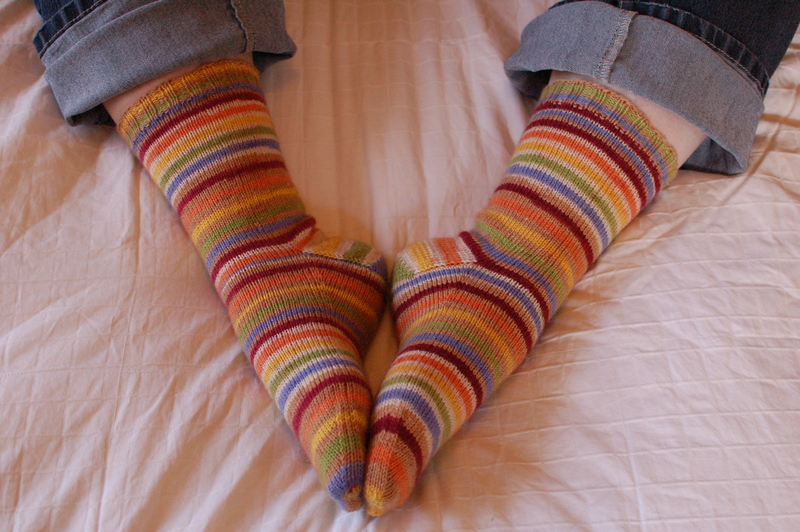 What’s your favorite nonbasic sock pattern? (I’ve done plenty of plain socks and want to branch out.) I’d especially like to hear about the ones that will work with troublesome pooling or handpainted yarns. For more Fiber Arts Friday fun, visit the roundup at Wisdom Begins in Wonder.